Odor and stain remover for surfaces without scrubbing. First, remove excess urine or waste with paper towels. Now, turn the nozzle to stream to saturate the entire soiled area, particularly the edges of the stain. Allow to air dry. Repeat as needed. After the final application has dried, rinse sparingly with water and blot dry with a paper towel, working from outside to center. No scrubbing required! Note: you may wish to spray a little Wee Away in a discreet spot to test your carpet for colorfastness. Do not shampoo carpet until after you have cleaned the area with Wee Away. Do not dilute. Natural bio-enzymatic solution that breaks down the uric acid and faecal matter to neutralize the odors and get rid of the stains. The enzyme system helps breakdown the organic component of the stain and releases it from the underlying fabric. It is also what Rufus & Coco Wee Away does not contain that makes it better! Q: Why do pets remark the same place over and over and how can I make this stop? A: Pets wish to mark their territory and have a very acute sense of smell. Even when the visible stain has been removed and the urine odor has been rendered imperceptible to humans, animals detect it and are compelled to re-apply their own scent! So once an animal has "gone" in one spot, they frequently return to it again and again, no matter what we do. If that spot is on your carpet, this can get very smelly! uric acid, a mild acid rich in nitrogen and ammonia. Uric acid contains a non-soluble salt which is extremely difficult to clean away. While most cleaning products can deal with urea and urochrome easily, they often fail to address the key issue of uric acid salts, which remain tightly bonded to the surface of your floor or carpet. Any moisture will reactivate these crystals and the smell will return! Most wee stain products are composed mainly of harsh detergents and masking agents which covers up the urine odor. In fact, many are so full of chemicals that you need to be careful to not inhale or have your pets or children in the room when in use – just look at the warnings on their packs. Some include alcohol as a solvent or chemicals to coat the uric acid crystals to “seal in” the odor. These are temporary solutions to a recurring problem, and tend not to address the stain at all. 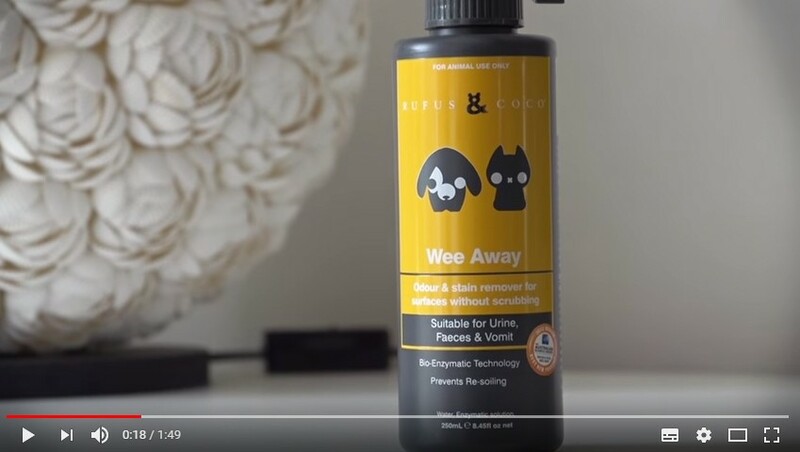 It is important not to use a cleaning product that contains ammonia, because this is similar to the smell of urine and can cause your dog to re-offend! But not Rufus & Coco’s Wee Away! It is 100% natural. It’s proven enzyme system helps breakdown the organic, uric acid component of the stain and release it from the underlying fabric. It will even work on old stains. This system has been formulated in consultation with biotech-enzyme supply experts to ensure that the efficacy and safety for consumers is maximised. It is important to never steam clean or shampoo your carpet with until you are absolutely sure you have gotten all of the uric acid crystals out of the carpet. If not, the steam or water will spread the uric crystals over a larger area, making the problem much worse. Oops! Sorry. Sometimes I can't help it and sometimes well, it's my way of leaving a little message... often in the same spot. But not anymore, with Rufus & Coco Wee Away the stain and odor is removed so I am not sure where I went last time. Now my owner is smiling like a Cheshire cat.